oh my gosh.....it's GORGEOUS on you! I absolutely love everything about it!!! You look gorgeous in that dress and I am glad to hear the apartment is coming together . What a gorgeous dress, Alison - the beading around the neckline is just perfect! So beautiful! I really love that dress. The neckline is truly gorgeous! I love the cuff bangle too! So pretty!!! Can't wait to see what you do accessorize with for the wedding. Also excited to see pictures of your new decorating!!! Maybe! I'm not the best at this whole home decor thing though... I feel like others are naturally gifted! Beautiful embellishment. From afar they look printed, but when I looked up close, the dimensions jumped out. Very unique. that dress is gorgeous!! Love the embellishments! That's awesome about your apartment, getting settled in can take some time! Love the bejeweled neckline! Especially because they are actual gems and not just a print! 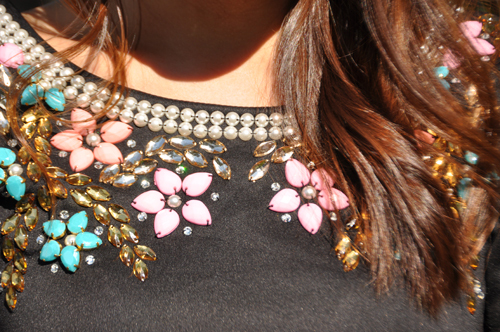 The embellishments on this dress is so gorgeous! Such a gorgeous dress girlie!! OMG DYINGGGGGGGGG! that dress is SERIOUSLY amazing.. omgosh i'm seriously falling over myself over the beading so gorgeous! you look beautiful in that dress! Very cute dress! It looks great on you! Love that dress! You look so pretty! Glad to hear your apartment is coming together!